You guessed it! That common household product is tape-the thin cellophane tape most people call “scotch tape”. Researchers working at the Australian National University used the sticky tape to peel layers off of ever thinner crystals to reduce the thickness of the cells. 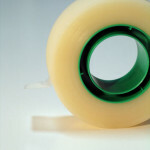 « Self-amalgamating Tape-What Is That?